Down the road from the animal shelter sits Santa Fe’s only enclosed dog park. A huge expanse on several acres, it features a small gated holding pen which walkers must pass through before entering the main run. Saturday morning, my friend (and fellow volunteer) Marilyn got a call from her husband. He’d just arrived at the park with their own dog, but instead of the usual early risers, he’d found a frightened Rottie mix standing alone in the holding pen. There’s no way a dog can get in or out of that pen on his own, so with no human in sight, it was clear he’d been left there intentionally. The dog gazed expectantly out at the parking lot. His eyes darted from one side to the other, searching for the owner he’d witnessed drive away… in the car they’d pulled up in together. Marilyn came immediately. She sat with the dog inside the pen, hoping a person would appear and explain the whole thing had been a misunderstanding. But no one ever materialized. Finally, she called Animal Control, and waited with the dog until an officer arrived. 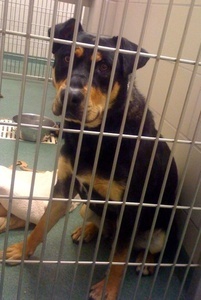 As law requires, the Rottie was still being held as a stray when I showed up for my Tuesday shift. Like Marilyn, I sat with the big dog as long as I could, hoping to help him feel less alone. I have no idea whether my presence was comforting or just a distraction, but he leaned in for pets and twice licked my cheek. I think of those eyes and quietly agree.